Do you want to help a little boy with Cancer? My friend Vladimir is looking for help. The 5 year old son, little Andrej, of a close friend needs a very expensive operation to hopefully cure his brain cancer. On his blog, Vladimir has the complete story about little Andrej and also a great offer: donate to Andrej's parents and get a free license of his software! Personally, I use Agenda At Once and Web Log Storming - Great Software! But obviously, this is not about getting free software, it is about helping a little boy. If you have a few euros or dollars to spare, even the smallest amounts help! Little Andrej's parents still need about €40,000.- (~$55,000 USD). If you PayPal me on my personal account (gertrijs@planet.nl) any amount you wish, I will double the amount you send (up to the discount amount) and transfer it to Andrej's parents. In return you receive a 25% discount on our programs. Any amount is OK, but please be generous. This offer is valid until the end of March April 2010. He is in the hospital now, He and his parents still need help! Some of my customers really surprise me, in a GOOD way. I know you are a good person. I should have a couple of checks in by tomorrow or Saturday. I'll make sure and donate then. More than that though, I will add Andrej to my prayer list. My 9-year-old daughter and I have a prayer list every night. If you could hear her pray, it would warm your heart. Please know she and I will pray for Andrej. A few days later she donated $100. Another customer donated $40 and ordered 2 extra licenses without any discount, asking for the promised discount to go to Andrej. Good people do exist in this world! Yes, there are a lot of you who donated who I did not mention. THANKS! Please note: the new task mentioned in this blog is now part of the just released version 4.6.2 of WatchDirectory. WatchDirectory already has a task called Automatically Print PDF files. That task uses Acrobat Reader in the background to print the PDF. We found a way to use the fantastic free Foxit Reader to print PDF's. Foxit Reader proves to be much faster and, more important, more reliable than Acrobat Reader. This new "Print PDF" plugin will be included in the next release of WatchDirectory. When you use this new task, you must tell it where Foxit Reader is installed and on which printer it should print the PDF's. This is the printer name as it shows on the Windows Control Panel printers applet. No typo's allowed. Please note that Windows maintains the list of printers separately for each login account. When you configure a "Print PDF" task to run as a Windows Service (on the How to Run panel), the task will run as user "LocalSystem". LocalSystem most likely doesn't have your printers installed so you must tell Windows to run this Service as another user (as "You"). Locate the WatchDirectory Service for your task. If you called the task "PrintMyPdf", the Windows Service is called "watchDirectory:PrintMyPdf"
Open its settings (right-click -> Properties) and change the account information so it uses another user and password. Fixed: Startup speed improvements on Windows-7 systems using (buggy) AHCI drivers from Intel. Fixed: When History wasn't set to "Maximal" in options, you could not view any history. New: Previously, the QUIET Event always fired multiple times, every "quiet interval" after the last real event. Now you can tell WatchDirectory to fire QUIET only once. For example, the Email task will only send 1 notification when there is no activity in the monitored directory. Updated: When the Auto FTP plugin is just checking if the connection to the server is still "alive" it will not send error messages anymore. Download the current version from the download page and install it "on top" of your current install. No need to uninstall your older (version 4) release first. Like all 4.x releases, this is a free upgrade for our customers. If you own a WatchDirectory version 4 license, you can upgrade to the current release at no cost. Tasks have a new window where you can set all kind of timing related things. Files bigger than 4GB would not download properly. You can now let WatchFTP rename the FTP file after it has been downloaded. For example, let WatchFTP add a ".downloaded" suffix to the filename. At the same time you can tell WatchFTP never to download files with these suffixes. 4 new Proxy methods, including SOCKS4 and SOCKS5. When WatchFTP has trouble downloading certain files (for example because they have an illegal filename), those files are automatically added to a "blacklist" and will not be downloaded again. The WF_FILE_E variable (Email and Batch file action) contained garbage when the file has no extension. A memory corruption is fixed, depending on your exact settings this may have caused your WF tasks to crash. This release is a Free Upgrade for all our WatchFTP customers. Just install this new release "on top" of your current release to keep all settings and tasks. This post will describe how you can configure WatchDirectory's Email Task to receive an email when a directory has no activity for some time. WatchDirectory and its Email Task are most often used to send email when new files are created or changed. To make it send an email when "nothing happened" might seem easy, just select the QUIET option on the Events page and WatchDirectory will "trigger" when no changes are detected. 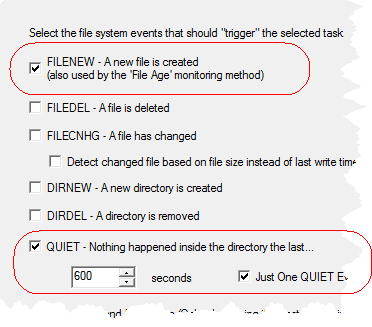 If you only select "QUIET" as the event, you will soon find you also receive emails even if there is activity (new files) in the monitored directory. Why is this? The issue is that "QUIET" needs other events to "compare against". When another event happens, for example "FILENEW" - a new file is created, WatchDirectory sets a timer for the QUIET event. If there is another event before the timer times out, the timer is reset again. So, if you want to receive an email when nothing happened for some time, you must enable both the QUIET and the FILENEW events. Obviously, now you will also receive emails when new files are created. Here is how you can configure WatchDirectory to prevent those emails for new files. The above are 2 Environment Variables you can use with the Email task. %WD_CONFIG% is replaced by the name of your task (for example "NotifyNoActivity") and %WD_REASON% is replaced by "what happened" (QUIET or FILENEW). "View -> Email -> Email Settings". At the bottom of the window that opens click "Filter Email" and the window to the left will open. On this window you can enter (partial) subjects and message body strings that will prevent WatchDirectory sending those emails. Every email, for all tasks you create that has the text "NotifyNoActivity-FILENEW" in its body, will not be sent.